More Zucchini!!!! We got 2 more or these big round zucchini's - such generous home growers! Again, I was thinking what to do with such a large quantity and of course thought of soup. I've based this one on my Carrot Curry Soup (still my fave!) and it turned out really well. 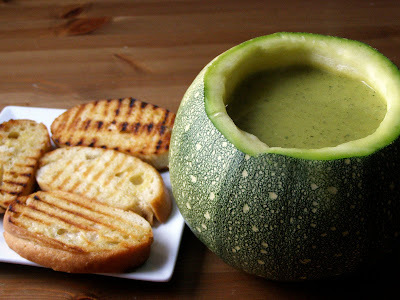 I kept the quantities the same and as zucchini has more water this soup turned out a bit more liquidy. As I like my soups thick I quickly cooked up some potato and added that to the soup before blending and really liked the result. Melt the margarine then add the onion and fry till just soft. Add the curry powder and gently 'toast' for 1 minute. Add a splash of the veg stock to de-glaze then add the rest. Bring to the boil then add the potato and zucchini. Boil with the lid on for about 15 minutes or until veg is very soft. Let cool slightly then blitz in a blender in batches till very smooth. Return to the pan and season with salt and pepper. (I would add pepper but no salt as the stock I use is salty enough) If you feel it needs it, add the lemon juice, adds a little 'freshness'. Also if you feel it's too thick, or spicy or both you can both thin and tone it down with some reduced fat coconut milk. Hi Rose! Yeah that's exactly what I said too when given these! I didn't even know they came round let alone so big. The one I used for the first soup was actually a lot smaller, but similar - they are good for soup, otherwise they take about a week to eat! !